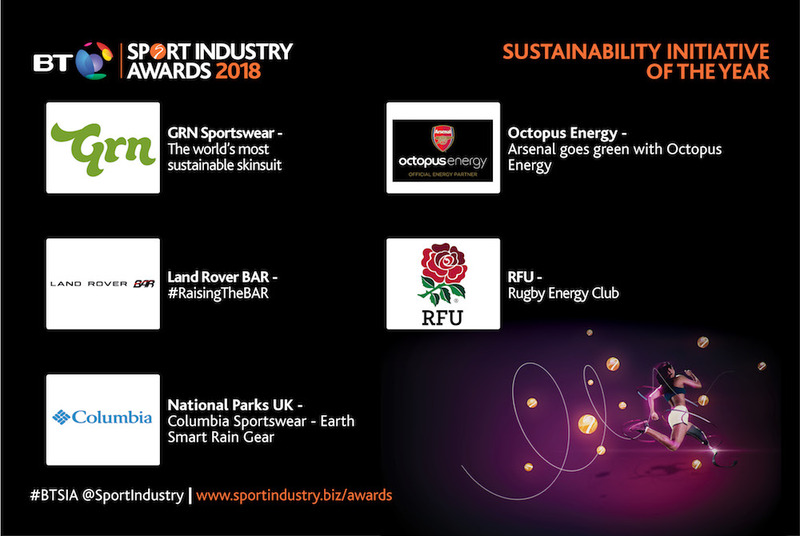 The Sustainability Initiative of the Year was introduced for the first time in 2018 to highlight and celebrate the very best organisations whose actions have empowered, promoted and embraced environmental sustainability in sport, while positively impacting business results. This year’s shortlist features: Columbia Sportswear’s partnership with National Parks UK; GRN Sportswear’s sustainable skinsuit; Land Rover BAR’s effort in #RaisingTheBAR; Octopus Energy turning Arsenal FC green; and RFU’s Rugby Energy Club. Columbia’s mission is to help people enjoy the outdoors longer, and in 2017 a new five-year partnership with all 15 of the UK’s National Parks saw UK National Park Rangers and staff working in the field in environmentally friendly kit, made from 100% recycled content. “By committing to outfitting the staff and rangers of the UK’s National Parks and working with the Parks to help as many people enjoy the outdoors for longer, Columbia has really found its reason for being in the UK,” said Columbia’s Eoin Treacy. On being shortlisted for the organisation’s first BT Sport Industry Award, Treacy added: “It was a real tipping point. Up to that point we had the feeling we were working consistently in the right direction, but the nomination for a BT Sport Industry Award gave real confidence to the team that we are starting to make a real difference. GRN Sportswear designs and manufactures performance sportswear that is made ethically and sustainably, producing cycling, triathlon and athletic wear out of waste products, including plastic bottles and abandoned fishing nets, and recently launched the world’s most sustainable cycling skin suit. The process to create each cycling jersey involves seven recycled plastic bottles, using 60% less energy and 94% less water than the alternative from virgin materials. For every tonne of recycled material used in GRN’s cycle shorts and tri-suits 1.26 tonnes of waste to landfill are avoided, while seven barrels of crude oil and 4.2 tonnes of CO2 emissions are saved. Lillie added: “Our market place is still going through an education process and we are determined to prove that performance and sustainability work hand in hand. The fact that we have been recognised and on the shortlist has given us the confidence that we are on the right track. Land Rover BAR used its profile as the British challenger in the America’s Cup to raise awareness of sustainability, develop an educational programme inspired by their racing boats, and their wide network of stakeholders to increase the impact that the team had on key environmental initiatives. Sustainability formed part of the team’s key messaging alongside technological innovation and the goal to #BringTheCupHome for the first time in British history. Grindley continued: “Sports teams represent key role models in society, we have seen how the power of sport can effect social change and now sport can have the same positive impact on environmental issues and can truly influence behavioural change around effecting positive environmental change. “It’s really important for those in a sporting environment to share their efforts and incentives and to be recognised for all the innovative work that’s being achieved. This awareness inspires others to follow. Arsenal FC wanted to demonstrate that zero-carbon energy can become the new normal, with Octopus Energy creating a bespoke solution - combining solar and anaerobic digestion to guarantee 100% green electricity 24/7, powering club and fans at a competitive price to fossil fuels. As a result, fans now benefit from 3,000KW of realtime-renewable electricity via the club’s floodlights at Emirates Stadium, saving 2.6m tonnes of CO2, the equivalent of 1.2m trees, in year one alone. Meanwhile Octopus Energy has already gained over 100,000 customers since signing the partnership – with a significant number driven to sign-up by Arsenal activity. Rugby Energy Club (REC) is the collective name for a series of RFU initiatives that help community rugby clubs, run by volunteers, reduce club running costs and improve sustainability. Themes include improving club procurement, providing advice on energy-saving technology, providing a non-commercial support environment, and supporting clubs through funding opportunities to overcome the capital barriers to sustainable solutions. RFU’s Dru Morton commented: “We’ve managed to reach more than 160 grassroot rugby clubs through our interactive energy nights and have awarded financial support of just under £150k to supporting clubs achieve their sustainability goals, meaning that clubs are really reaping the benefits of joining the Rugby Energy Club. Sustainability as a theme is often overlooked in sport but the feedback we’re received has shown its value to both our clubs and our sport, which we hope in turn has a positive impact on all those who participate. “It’s been truly tremendous to be recognised in the shortlist for the BT Sport Industry Awards,” continued Morton. “We know that what we are doing is genuinely beneficial for our clubs and their communities and the scheme is demonstrating a real impact in the game, but to be recognised within the industry is really special. Check out the full shortlist for the BT Sport Industry Awards here. The BT Sport Industry Awards are the largest commercial sports awards in the world, taking place at Battersea Evolution in London, on Thursday 26th April 2018. Bringing together sports stars, celebrities, senior decision makers, influencers and global media, the industry’s most anticipated night of the year celebrates the very best work from across the sector. The famous trophies are awarded on-stage in front of a sell-out crowd of 1,700 guests at the star-studded event, held annually in London. Both Gold and Silver tables are now SOLD OUT, but Bronze table packages and individual places are still available to purchase here. For more information on the event click here, and follow @SportIndustry #BTSIA.